A five-CD box set, containing more than 100 tracks in an eclectic mix that will suit just about everyone. There are songs from the Beach Boys to Queen and just about everywhere else along the way. The box set is a great gift that's sure to keep everyone happy on long car journeys. It's the film's 40th anniversary, but we'd still wager that very few people wouldn't crack a smile if this arrived under their Christmas tree. Jumping in the jalopy and cranking up the volume to such classics as Days Like These would make even a cold January morning seem bearable. All the usual suspects on this driving album, with AC/DC, Fleetwood Mac and the Cars among the 20 featured artists. Extra value is supplied, however, by the inclusion of Life In The Fastlane, a DVD insight into the world of F1 champ Lewis Hamilton. Another box set containing more than 100 classic driving tracks. Despite the cover design, this collection contains a wide variety of classic tracks honed with a fresh contemporary edge. The contents actually appear to have been included for their quality, rather than oblique references to driving in the title. Log on to browse the track-listing for yourself. 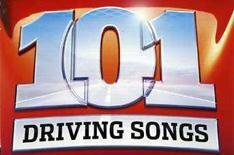 Features 50 driving rock karaoke tracks on three special CD+G discs. Professional quality karaoke backing tracks with no fade out endings. With artists such as Billy Idol, Bruce Springsteen and Guns 'N' Roses we're sure you can see where it's coming from. Nicolas Cage plays a legendary car thief who's drawn out of retirement to orchestrate one final job of all jobs to steal a collection of the world's best cars. Far from being a hi-octane smash and grab, the soundtrack is a diverse and multi-layered collection of tracks from the Chemical Brothers to The Cult.